As you’ve heard by now, last night John Bogle, the father of the Index Fund and the founder of Vanguard Group, died at the age of 89. Bogle was a legendary investor and one of the fiercest advocates for lower fees and long-term investing, bringing market gains to millions of retail investors. According to The Wall Street Journal, Bogle created the first mutual fund tied directly to the index in 1975. While I’ll leave it to others to recount Jack’s many glories, most of which have been told and re-told, I’ll get a bit more personal, having known Jack since the late 1980s when I was an editor at U.S. News & World Report and he would make regular stops in my office. Jack liked to stop by and talk about investing, about the fund industry and yes, Vanguard as well. His low-cost mantra wasn’t fully-formed back then but his desire to paint Vanguard as a virtuous non-profit dedicated to the shareholder was in full bloom. It was only after I began writing and publishing The Vanguard Adviser in 1991 did Jack begin to change his tune. He wasn’t happy that an independent voice free of the taint of advertising and consulting fees was speaking out about his funds. His ego, dented by my disclosures of his multi-million dollar compensation irked him enough to sue me, but when the press turned against him he ultimately decided to settle, rather than fight. Over the years we had our conversations and correspondence, always private. 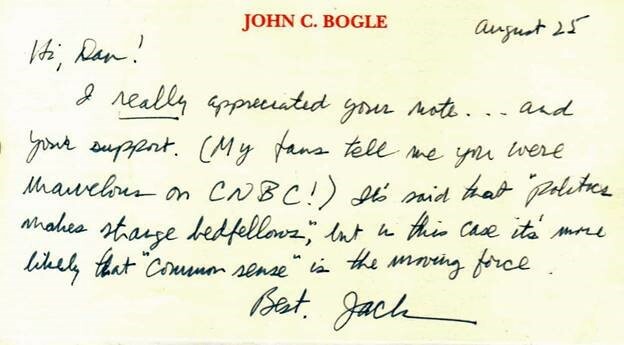 Some time after he was thrown off the Board of Directors we had a back-and-forth and Jack sent me a nice, handwritten note, where he noted his distaste for the new leadership at Vanguard and reflected on an interview I’d done with CNBC on that topic. One funny story: When Jack had his heart transplant in Feb. 1996, I sent him an email wishing him well, and good health. He responded to me, not as Jack Bogle, but in the guise of one of his doctors, who noted that my email had raised his heart rate and that I should refrain from further emails until he was recovered. When I later found out we had a good laugh, at my expense. Dan brings his experience and knowledge of Vanguard to his subscribers every month in The Independent Adviser for Vanguard investors. You can find out more about Dan and his writing here. Earnings season kicked off this week with quarterly reports from most of the big banks, and there was mostly good news. Many market watchers were looking to these results as a bellwether for the rest of the quarter. Worries over a slowing economy and global trade tensions are wearing on investors, even as overall US economic growth remains solid, as I wrote about in previous issues of the Digest. Goldman Sachs reported earnings per share of $6.04, coming in well above wall street estimates of $5.61 per share. This number stands in stark relief to the company’s losses per share of $5.51 from the fourth quarter of 2017. Goldman Sachs earnings for the fourth quarter of the year also includes net income of $2.54 billion. The banking company’s net loss from the same period of the year prior was $1.93 billion. GS stock jumped more than 10% on the news. Bank of America reported earnings per share of 70 cents, a substantial increase over the earnings per share of 20 cents from the same time last year, and a number that also beat wall street expectations of 63 cents earnings per share for the period. The bank did note that part of the increase to its earnings per share is due to the 2018 tax cut. BAC also reported net income of $7.30 billion. This is up from the company’s net income of $2.4 billion reported in the fourth quarter of 2017. BAC stock was up 7% after the earnings report. Citigroup reported 3.9% earnings growth for Q4 2018, plus it reported significant expense control and lower cost of credit. Adjusted net income per share of $1.61 exceeded wall street expectations and adjusted earnings rose 26% year-over-year. The stock is up almost 8% since the announcement. JP Morgan bucked the trend by missing earnings estimates. JPM reported that it earned $7.06 billion, $1.98 per share, on revenue of $26.8 billion for the quarter. Analysts had been expecting $2.20 per share of earnings and hoping for $2.22, with net revenue of $27.1 billion. After the announcement Tuesday morning, the stock dropped considerable, but is now up a little over 3%, suggesting some bargain hunting. Despite the (mostly) good news for the big bank stocks, Ken Trester, editor of Power Options Weekly, still sees a real downside for the Financial Select Spider Fund ETF (XLF). Ken thinks that despite the good reports from the big banks, the vulnerability of smaller banks to market forces means the sector is still weak. In a note to his subscribers yesterday, he explained why he believes that means ETFs, like XLF, are still very vulnerable. Looking at the chart of XLF, we can see a few areas of potential resistance. It formed support just above the $25 level in October of 2018. Regular readers know, old support can act as new resistance, and even if XLF makes it past $25, it will still have to cross the $26 level, which acted as support throughout November and December. XLF’s performance depends on both big and small banks, and it won’t overcome resistance without some positive earnings numbers from across its many holdings. For that reason, I am recommending a bearish trade this morning. Using a spread order, buy to open the XLF March 15th $24 put and sell to open the XLF March 15th $22 put for a net debit of about $0.50. Ken keeps his subscribers up to date with all his calls like these in his Power Options Weekly service. To learn more about Ken and his calls, click here. Article printed from InvestorPlace Media, https://investorplace.com/2019/01/30-years-covering-john-bogle-and-vanguard/.